This cartoon image provided by the New York Post appeared Wednesday, Feb. 18, 2009. Now, News Corps. has agreed to form a diversity council following the highly-criticized illustration. News Corp. has agreed to form an external diversity council after meeting with civil rights groups about a New York Post cartoon that critics said likened President Barack Obama to a dead chimpanzee. The company will form a "diversity community council" in New York City that will meet with senior company executives twice a year, NAACP President and CEO Benjamin Todd Jealous said Wednesday. It also will include a statement of commitment to diversity in its annual report. News Corp. Chairman Rupert Murdoch published an apology in the Post soon after the cartoon appeared in February, but pressure for further action continued. Jealous called the cartoon an "invitation for assassination" and urged a boycott of the paper and the firing of the editor and cartoonist. The Rev. Al Sharpton asked the Federal Communications Commission to review policies allowing News Corp. to control multiple media outlets in the same market. Representatives from the National Association for the Advancement of Colored People, Sharpton's National Action Network, the National Urban League and 100 Black Men of America met with News Corp. executives on May 19. Those groups will be represented on the new committee, said News Corp. spokesman Jack Horner. The membership was still being finalized, but Horner said it would also include organizations such as the Hispanic Federation, Alianza Dominicana and the New York Gauchos, which offers after-school programs and is best known for its top-flight youth basketball teams. He said Sharpton, a longtime adversary of the New York Post, will not be on the panel. Committee members are not paid, Horner said, and no donations are part of the agreement. Similar diversity advisory boards already exist in Chicago and Los Angeles, Horner said. "This is an expansion of what we've had elsewhere," he said. "The key is we're always responding and learning from our communities." It was unclear what effect the agreement would have within News Corp., whose New York Post and Fox News Channel properties have been persistently criticized by minorities as insensitive or sometimes racist. Maurice Cox, vice president for diversity at PepsiCo Inc., said his company established similar external advisory committees about 10 years ago. "They have paid significant dividends for us," he said. The relationship often includes tension because the advisers don't have to worry about offending company executives, Cox said. "There has to be huge trust" for the committees to be effective, he said. "You have to feel comfortable, your CEO has to feel comfortable sitting across the table from someone who might stare him or her down." 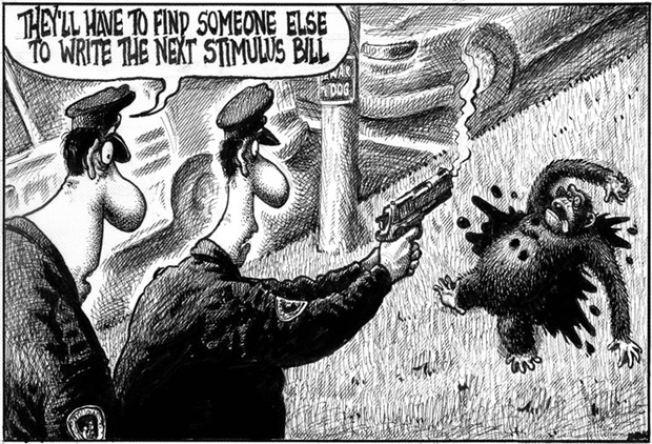 The cartoon, by Post provocateur Sean Delonas, appeared as Obama's stimulus bill moved through Congress and after a violent pet chimp was killed by police in Connecticut. It depicted the body of a bullet-riddled chimp and two police officers. The caption read: "They'll have to find someone else to write the next stimulus bill." There was an immediate outcry from average citizens and community organizations. At first, the Post issued a qualified apology, saying the cartoon was meant to mock only the stimulus bill. But it added that some media and public figures who have long-standing differences with the tabloid — implicating Sharpton, who had recently been the subject of critical coverage — saw the cartoon "as an opportunity for payback."